Loring Cold War Official study of the history / mission and features of Loring AFB. Strategic Locations and Limestone, Maine. In selecting strategic locations for the new SAC bases, special consideration was given to the fact that technological advances made the route over the Arctic Circle the shortest one from America to the majority of strategic targets in the Soviet Union for long-range aircraft and missiles. As a result, sites were chosen along America's northern tier, with the northeastern United States closer to targets in the European portion of the Soviet Union than any other part of the continental United States. In 1947, the New England Division of the U.S. Army Corps of Engineers (USACE) chose a site in northeastern Aroostook County, Maine, in the northwestern part of Limestone Township extending into the southwestern part of the Caswell Plantation, as the location for a new SAC bomber base. Limestone Army Air Field (AAF) was the Division's largest project. Limestone AAF was redesignated as Limestone AFB when the Air Force was established as an independent agency in September 1947. In 1954, the base was renamed Loring AFB in honor of Charles J. Loring, Jr., a Portland, Maine, native, who died during the Korean War as a result of deliberately diving his damaged aircraft into an enemy artillery installation and destroying it. Phase I Construction. Limestone AAF was authorized for construction in April 1947. Limestone was the first base in the country designed and built specifically as an SAC base and incorporated the concepts of strategy and high-speed heavy aircraft, specifically the B-36 Peacemaker (Stevens and Tyson 1980:4). The original master plan called for two parallel north-south runways, as well as a 12,000-foot east-west runway. The original design called for taxiways and aprons to accommodate more than 100 aircraft (Stevens and Tyson 1980:4,7). The entire plan never became a reality. Because the proposed project was so large and government funds were limited, construction progressed in phases. Multi-million-dollar contracts were awarded by the New England Division of the USACE to the contracting company in charge of each phase of construction. On 23 May 1947, USACE issued a $17-million contract to the Lane Construction Corporation of Meriden, Connecticut, and T.W. Cunningham, Inc., of Bangor, Maine, to begin the first phase of construction. This first phase included the engineering of a single north-south runway with a parallel taxiway and parking apron, an Arch Hangar, a Base Operations Building with a seven-story control tower, an electric power generation plant, a 250-man permanent barracks (Building 6000), a water supply system, and a railroad spur. The Arch Hangar was one of two identical structures simultaneously built as the largest monolithic arch roof structures to date in the United States. According to Parkman, the Loring AFB hangar "was one of the largest hangars in the world" (Parkman 978:144). Allen also indicated that the Loring AFB hangar contained "several unique features from the standpoint of concrete construction" (Allen 1950:405). Important construction features included the foundation set on bedrock, the extensive column-on-pedestal-on-footing abutment construction, the intricate formwork required, the elaborate system of rails and jacks required to move the formwork, the thinness of the concrete slab roof, and the 340-foot span of the arch. Construction of Loring AFB's runways was another elaborate feat of engineering. Special construction techniques were developed to deal with the airfield's unusual site conditions of "long winters, deep frost, rolling ground, bogs, forest and even potatoes" (Engineering News Record 1949:56-57). Heavy earthwork removed 2.1 million cubic yards of material. Frost damage was avoided by providing a foundation thickness of 70 inches of flexible bituminous-concrete pavement used over an impressive 10,000-foot by 300-foot area. The runway was later extended to 12,100 feet, making it one of the world's longest (Engineering News Record 1957:40). Phase I construction was completed on 30 June 1949. Completion and Mission of Loring AFB. 15 June 1950 was set as the date for beginning limited operations at Loring AFB in response to increasing Cold War tensions. On 10 June 1950, 7 SAC officers and 78 SAC airmen, constituting a base detachment, arrived as a tenant unit during construction. The first aircraft, an Oklahoma cargo plane, was received and dispatched on 12 June. The first B-36 arrived and departed on 16 June. On 1 July, the base detachment was designated as the 4215 Base Service Squadron. In light of the escalating conflict in Korea, it was decided that the base would be permanently assigned 28 officers, 340 airmen, and 20 civilians. By August 1950, more routine transient aircraft began using the base and the first permanently assigned aircraft, a C-47, arrived. By November 1950, the base had 19 officers and 172 airmen. The increased military funding from Congress to support South Korea resulted in the acceleration of construction at Loring AFB in 1951. Eight additional hangars were constructed at the southern end of the runway, and the runway was extended to the north. A weapons storage area was also begun at this time. In 1951, the Department of Defense (DOD) allocated funds for the construction of an ordnance storage site at Loring AFB. The designs called for a self-sufficient "maximum security storage area for the most advanced weapons of mankind" (Stevens and Tyson 1980:27). The mission of the facility would be the protection and maintenance of the weapons used by SAC. The facility was situated in the northeast corner of the base, and construction began on 4 August 1951. In addition to 28 storage igloos and other weapons storage structures, the facility included weapons maintenance buildings, barracks, recreational facilities, a warehouse, and offices. Though not yet complete, the weapons storage facility was partially occupied and activated on 1 November 1951. The area was then known as the Caribou Air Force Station, or East Loring. On 15 December 1951, the 3080th Aviation Depot Group was activated under the Air Materiel Command and assumed control of the area (Stevens and Tyson 1980:chronology). Construction of the facility was completed on 10 April 1952. The installation (Site "Easy" was it's code name prior to construction) was originally known as "North River Depot". The area was a complete mini-base whose mission would be to protect the nuclear weapons deployed by the United States. In addition, site "Easy" would be the largest of 5 original operational storage sites, and the first operational nuclear storage site in the Air Force. By the end of 1952, the base had a number of newly or nearly completed buildings including a motor pool building, a communications facility, a hospital, three barracks, a school, an officers club, a bakery, and a briefing and training building. By this time, the new Air Force design concept was becoming evident at Loring AFB. Surrounding vegetation was retained as much as possible for camouflage, and the traditional rigid military layout of roads and buildings was avoided (Stevens and Tyson 1980:27). During 1952, the North River Depot received the Mark-VI nuclear bomb, the first nuclear weapon delivered to the Air Force since the Fat Man bomb of WWII. The new bomb's nuclear material was in a "capsule" that would be inserted by the air crew just prior to dropping. General Curtis E. LeMay visited Loring AFB on 8 February 1953 to review progress. He indicated that the base was ready for a bombardment wing assignment and full operations. On 15 February 1953, command of the Limestone facility was transferred from the USACE to SAC. Personnel of the 4215th base detachment were reassigned to the 42nd Bombardment Wing (BW), and the wing was activated and assigned to the 8th Air Force. The 42nd had been inactivated in May 1946 after serving in the Pacific Theater of Operations, and later as part of the American occupation force in Japan after the war. With these assignments, on 25 February 1953, Loring AFB became operational. During its early months, the Wing flew training missions and handled deployments of other units. In March and April 1953, aircraft maintenance crews began setting up full-scale B-36 operations. Ten B-36 bombers arrived in April 1953, giving the 69th Bombardment Squadron a full complement of aircraft. By 31 August, the wing had 27 B-36 bombers, 322 officers, 313 airmen, and 350 civilians. In that year, construction of a chapel, gym, commissary, photo laboratory, and headquarters building was begun. On 7 January 1954, the 42nd BW was declared operationally capable of implementing its Emergency War Plan. On 1 October 1954, the base was renamed Loring AFB for Major Charles Joseph Loring, Jr., a native of Portland, Maine, who in 1952 dove his damaged fighter into enemy emplacements in Korea. On 8 October 1954, the 45th Air Division was activated as the primary base unit. In that month, Loring AFB was designated as the primary staging location for jet fighter aircraft flying between the United States and Europe. This action significantly increased the transient traffic at Loring AFB. By the end of 1954, Loring AFB had 63 assigned aircraft. With additional aircraft arriving in the mid-1950s, a number of additional hangars were constructed at Loring AFB. In 1955, Loring AFB's DC (Double Cantilever) Hangar, approximately 250 by 600 feet, was constructed. A product of revolutionary engineering design, it was one of the first double cantilever hangars built for the Air Force in response to SAC's demand for larger, more efficient maintenance space. The interior of the hangar consists of a network of steel arched trusses and perfectly balanced cantilevers. The hangar was the focus of Loring AFB's aircraft maintenance system. It was the first and only hangar capable of housing five B-36s (the largest aircraft ever built) or six B-52s, and far surpassed Loring AFB's other hangars in maintenance capabilities. As such, the DC Hangar was critical to sustaining the base aircraft's peak ready condition during this period. By 1956, 18 additional "nose-dock" hangars had been constructed northwest of the runway at Loring AFB. Each could accommodate the nose and wings of a bomber, and provided general aircraft maintenance space. Additional taxiways and parking aprons to accommodate aircraft movement to and from the new hangars were also constructed at this time. The steady progression of the Cold War necessitated continual updating of techniques and aircraft. The first KC-97 Stratofreighter tankers arrived at Loring AFB with the activation of the 42nd Air Refueling Squadron (AREFS) at Loring AFB on 18 January 1955. Because Loring AFB's B-36 aircraft were not equipped for air refueling, the tankers assigned to the base initially supported other units. The squadron's first in-flight refueling mission was completed on 8 March 1955. Eventually, 21 tankers and 30 air crews were added to the Loring AFB inventory to accommodate the refueling mission. 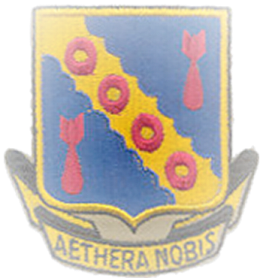 By 1955, Loring AFB's composition included four bombardment squadrons (#42, 69, 70, and 75), a Field Maintenance Squadron, a Periodic Maintenance Squadron, an Armament and Electronics Maintenance Squadron, a Tactical Hospital, a U.S. Air Force Hospital, an Air Base Group, an Operations Squadron, a Supply Squadron, a Motor Vehicle Squadron, an Air Police Squadron, a Food Service Squadron, an Installation Squadron, and an Air Force Band (Kohn and Harahan 1988:101). On 9 January 1956, the year following its introduction to the Air Force, the first B-52 Stratofortress landed at Loring AFB as part of a cold weather testing program. Loring AFB's first permanent B-52 arrived on 16 June 1956. (The main runway had been resurfaced the previous year in anticipation of its arrival.) It was christened the "State of Maine" with a bottle containing waters from both the Atlantic and Pacific Oceans, a symbol of the craft's ability to fly from ocean to ocean without refueling. The first KC-135 Stratotanker, christened the "Aroostook Queen," arrived at Loring AFB on 16 October 1957. Its missions included electronic reconnaissance, airborne command and control, electronic warfare, military airlift, and aerial refueling of bombers under all conditions. By 6 December 1957, all KC-97 had left Loring AFB; 20 KC-135 tankers arrived by April 1958; and the 42nd Air Refueling Squadron attained combat-ready status 1 month later. On 10 November 1956, the Soviet Union threatened to send volunteers to oust British and French troops from the Middle East. President Dwight D. Eisenhower urged the United Nations to counter any action by the Soviet Union; SAC was alerted on 15 November to support whatever action the United States committed to follow. At that time, P.D. Eldred, a reporter with Associated Press (AP), went to Castle AFB, California, to get details about the B-52. Failing to get answers to technical questions then considered to be classified information, Eldred appeared to have manufactured his own answers. His article painted a dismal picture of maintenance requirements for the new bomber. In response, SAC planned Operation Quick Kick, a flight around the perimeter of North America to coincide with the release of the Eldred story. The operation, executed by four 93d B W B-52s from Castle AFB and four B-52s of the 42nd BW, Loring AFB, took place on 24-25 November. The longest individual flight was commanded by Lieutenant Colonel Marcus Hill of the 93d B W, whose flight lasted 31 hours 30 minutes and covered approximately 13,500 nautical miles (Hopkins and Goldberg 1986:59). Following the successful conclusion of the operation, several of the bombers landed at Baltimore International Airport and were met by television, newspaper, and newsreel reporters. The operation was given such great publicity that Eldred's story on the B-52 was buried by the headlines announcing Operation Quick Kick. The flights were hailed by the press as a warning to potential enemies and may have contributed to the Soviets quietly dropping the issue of sending volunteers to the Middle East. An Alert Force was established at Loring AFB in October 1957. The wing began supporting the alert force with six B-52s in January 1958. In response to a conflict in Lebanon, the Alert Force was expanded to include the entire bombardment wing in July 1958, when the SAC bomber force went to full alert status. SAC's overall one-third goal was achieved in 1960. A special area was typically designated on an Air Force base to meet the specific requirements of the Alert Force while on duty. A high-security component of the base, the Alert Area was the vital nucleus of the Alert Force mission. It provided special accommodations for bombers and t ankers on alert, and for the alert crews whose activities were restricted while on duty. In many cases, the Alert Area was also the hub for much of the strategic planning and tactical intelligence related to alert missions. At Loring AFB, the largest feature of the Alert Area is the parking apron, referred to as the "Christmas tree" or the "crow's foot" because of the distinctive configuration of five branching parking spaces. The main building in the area is the Alert Crew Readiness Building, which accommodates living, sleeping, working, and recreational space for the alert crews on duty. A large, sprawling structure, its distinctive exterior feature is a number of tunnels that project from the basement and ground levels to give clear access to bombers on the apron once the alert klaxon has been sounded. Security-related structures in the area include a surveillance tower, an entry control building, and a surrounding fence. At Loring AFB, the decade of the 1970s was a period of uncertainty. On I 1 March 1976, Headquarters SAC announced that the 42nd BW would be inactivated; the decision was reversed in 1979. The strategic value of the location of Loring AFB reportedly played a major role in the reversal of the decision. During the 1980s, Loring AFB became a non-nuclear base and its bombers were equipped to carry conventional bombs. Increased funding during this period allowed the completion of a second fully capable runway and a number of major renovations. With the disestablishment of SAC in 1992, Loring AFB was transferred to the ACC. On 16 November 1993 the last B-52 departed Loring AFB. Flying missions for the 42nd BW came to a close with ceremonies held on 4 February 1994 to commemorate the role of the refuelers in Loring AFB's history. KC-135s flew missions through 22 February 1994. The last tanker departed Loring AFB on 2 March 1994. Loring AFB was closed in September 1994.